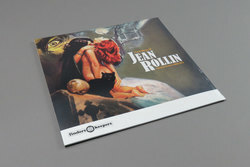 Various Artists - The B-Music Of Jean Rollin 1968-1975. Vinyl LP. Bleep. The films of late French director Jean Rollin (1938-2010) hold a place in the annals of French cinema akin to how Brits view the Hammer Horror flicks. Camp, ghoulish and saucy, the films Rollin directed have left a lasting impact on the world of the B-Movie - a world, of course, that tends to provide great finds for the intrepid audiophiles. Finders Keepers Records do the hard work for us here, combing the archives and collating nineteen cuts from Rollin’s first decade on set. Pitched somewhere between Serge Gainsbourg, Gong and the BBC Radiophonic Workshop, the music herein is a fantastically fun listen.